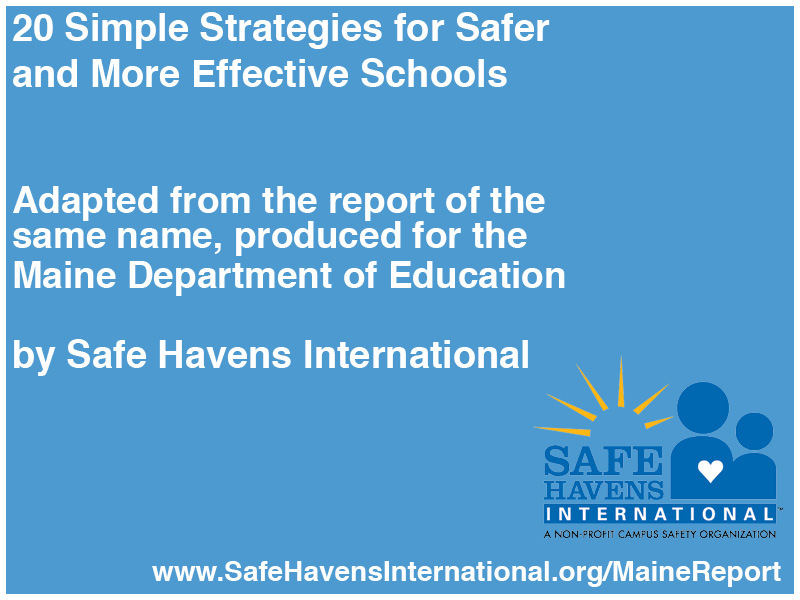 This page is an informational page about the creation of the document “Twenty Simple Strategies to Safer and More Effective Schools” prepared by Safe Havens International for the Maine Department of Education. The co-authors of this report all serve as analysts with Safe Havens International, a non-profit safety center focused on serving early childcare centers, K12 schools, institutions of higher learning, and places of worship. Safe Havens analysts have worked in more than two-dozen countries and provided assistance to a wide array of organizations including the United States Departments of Education, Justice and Homeland Security. Safe Havens’ analysts have authored over thirty books as well as the United States Department of Homeland Security web course IS-360: Preparing for Mass Casualty Incidents: A Guide for Schools and Houses of Worship web course which was part of the 2013 White House School Safety Initiative. Safe Havens analysts have assisted in five-state-wide school security assessments projects and have assisted client with school security assessmentsfor more than 6,000 public and non-public schools. In addition to their extensive experience as practitioners, they have keynoted hundreds of state, national and international professional conferences in most of the 50 states as well as Canada, Jamaica, Nigeria and Vietnam. Michael Dorn – serves as the Executive Director of Safe Havens International. Michael has published 27 books and his work has taken him to Central America, Mexico, Canada, Europe, Africa, Asia and the Middle East. Michael is a graduate of the FBI National Academy 181st session and received a fellowship with the Georgia International Law Enforcement Exchange program (GILEE), which included travel to Israel for fourteen days of orientation and training with the Israel Police, Israel Defense Forces and the Mossad. Michael had a distinguished 25-year public safety career service as a university police lieutenant, school district police chief, School Safety Specialist for the Georgia Emergency Management Agency – Office of the Governor and as the Lead Program Manager for the Terrorism Division of the Georgia Office of Homeland Security. Michael advised United States Attorney General Janet Reno on ways to reduce homicides involving firearms in American schools and worked on the 2013 White House School Safety Initiative. Michael serves as a regular guest expert for news outlets including ABC, NBC, CNN, Fox News, Al Jazeera America, the Christian Science Monitor and many others. Phuong Nguyen – serves as the Director of Public Information for Safe Havens International, Mrs. Nguyen is a trained and skilled researcher, having completed document preparation for major school safety assessment projects for the Center for Safe Schools funded by Pennsylvania Department of Education, the Hawaii Department of Education, the Maine Department of Education, the Wisconsin Homeland Security Council, the Indiana Department of Education, as well as oversight for all reporting for Safe Havens’ school safety assessment projects covering more than 3,000 public, private, charter, independent and parochial schools. Mrs. Nguyen also served as a research consultant for the White House’s IS-360: Preparing for Mass Casualty Incidents: A Guide for Schools and Houses of Worship web course released in June, 2013. Mrs. Nguyen holds an MA degree in Applied Linguistics from Vietnam National University, an MA degree in Mass Communications from Texas Tech University, and is presently enrolled in the MS dual degree program for Cyber Security/MBA at the University of Maryland University College. Chris Dorn – serves as an Analyst with Safe Havens International. Chris’ work in school safety started in 1997 when he was in the 7th grade and since then his school safety work has taken him across the United States and to Bolivia, Canada, England, France, Holland, Mexico, South Africa and Vietnam. In addition to serving on the authoring team for the White House Initiative web course, Chris has co-authored 6 books as well as numerous other publications and is the award-winning Executive Producer of over 100 school safety training videos for schools around the world. Organizations that he has trained or that use his training materials include the FBI, TSA, DHS, BATFE, Jane’s Consultancy, Israel Police, British Intelligence agencies, the International Association of Chief’s of Police, the National Association of Pupil Transportation, Vietnam National University and thousands of law enforcement agencies and school systems in all 50 states and several dozen countries. A graduate of the Georgia Institute of Technology, Chris has a BA in International Affairs and Modern Languages with a focus in French and a Certificate of Marketing from Georgia Tech’s Scheller College of Business. Dr. Sonayia Shepherd (“Sony”) has authored and co-authored sixteen books on school safety and emergency management, including four books for Jane’s Information Group. Her unique professional background includes serving as an Area School Safety Coordinator for the nation’s largest state school safety center – the School Safety Project in the Georgia Emergency Management Agency – Office of the Governor, as well as serving as the State Antiterrorism Planner for the Terrorism Division of the Georgia Office of Homeland Security, the State Bioterrorism Preparedness and Emergency Response Exercise Director for the Georgia Department of Public Health, and as an Incident Support Specialist for the Centers for Disease Control. An expert in mass casualty event planning, Dr. Shepherd has provided response and recovery support following many school crisis situations and major disasters around the world including Hurricane Katrina, the tsunami in Indonesia, and outbreaks of deadly diseases in Africa and Asia. She earned her graduate degree in Clinical Psychology and earned her undergraduate degrees in Political Science and Spanish. She also holds a Ph.D. in Public Administration & Emergency Response Policy. Russell Bentley – is a 20-year police veteran with 15 years of experience in executive positions with campus police agencies. He has served as police chief for over seven years at both the K-12 and post-secondary levels. Russell is a 2001 graduate of the FBI National Academy and has received extensive formal training in law enforcement and emergency management. Russell has completed more than 1,600 hours of advanced level law enforcement and emergency management training at the state and federal level and holds a Master of Science Degree in Administration and a Bachelor of Science Degree in Child Development and Family Life Education, both from Georgia College and State University. Russell served for five years with the Macon Police Department working undercover narcotics, patrol division, crime prevention bureau, communications division, housing authority unit and was promoted to police sergeant. He served as Chief of Police for the Fort Valley State University Police Department for two years and currently serves as a school district police chief. His department has been widely featured as a model school law enforcement partnership by many agencies including the U.S. Department of Education, the International Association of Chiefs of Police and the U.S. Justice Department. Steve Satterly – serves as the Director of Transportation and School Safety for an Indiana public school district. He is a certified Indiana School Safety Specialist, and an alumnus of the Indianapolis FBI Citizen’s Academy. He has received numerous law enforcement training certifications, including basic certification in Active Shooter Doctrine and as a Gang Specialist. He has presented at the state and national level, and has written for Campus Safety Magazine, School Planning and Management Magazine and School Transportation News Magazine. He has also served as a research consultant for the 2013 White House School Safety Initiative, and has presented at Active Shooter workshops for the United States Department of Homeland Security. Steve served as a drill instructor in the United States Army, as a teacher in a Catholic school and as a middle school principal prior to being selected for his current position. Rachel Wilson – serves as an analyst and is also the senior photographer for Safe Havens International and is part of the award-winning Safe Havens Video crew. In addition to her work on the photos for this report, she also worked closely with the authoring team and assisted with content development and review. In addition to serving as lead photographer as well as a videographer for Safe Havens Video since 2009, Rachel Wilson has also assisted with all major assessment projects conducted by Safe Havens International since the fall of 2012. All photography, unless noted otherwise, is by Rachel Wilson for Safe Havens International.